With retirement slowly but surely happening, I’m finding time for a little more railway modelling. It’s surprising what one can achieve with, say, an average of an hour a day spent with one’s hobby. I’m starting (or trying to finish) a number of projects, this thread will become the classic “On my workbench.” series. You have no doubt forgotten about my changes to my American N-club modules, cutting the layout size, and simplifying it into a switching layout as below. Well, having got the boards set up and stripped the track off the large board, the design was further modified. The first, small board, has just a headshunt added. This will be easy to wire, too, as the new headshunt point will be a crossover with the main line. 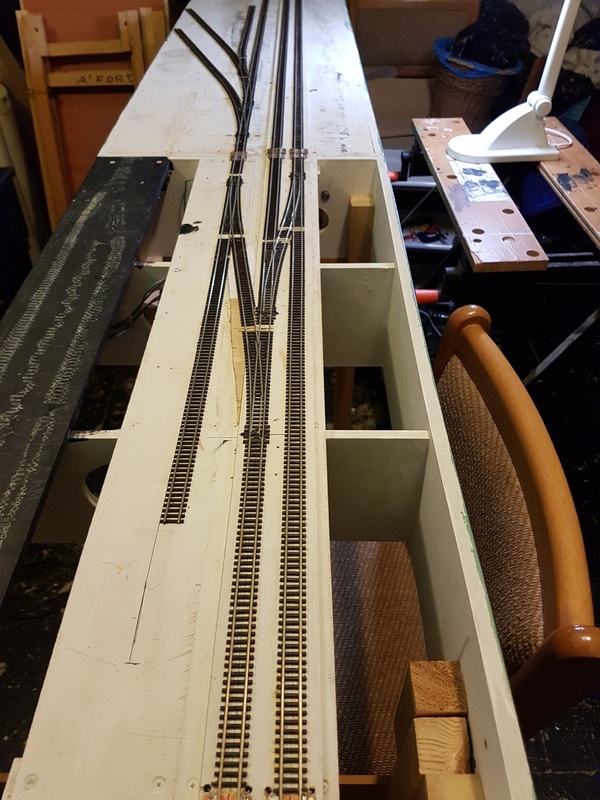 The headshunt will be electrically a separate section to allow a local switching locomotive to be held whilst wagons are exchanged with the main line. 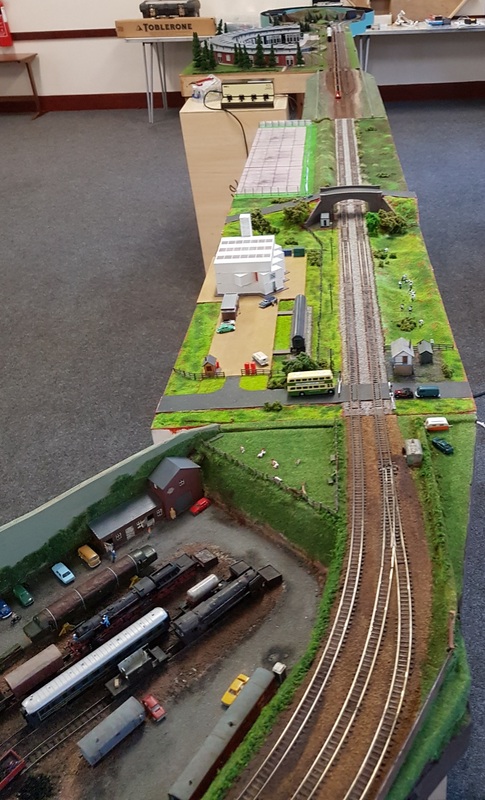 The layout still has four sidings, but they are all on the large board as below. The design ‘felt’ more ‘right’ than the original plan. It will also be easier to wire up – just the two wires and the electrofrog wiring on the Peco points. 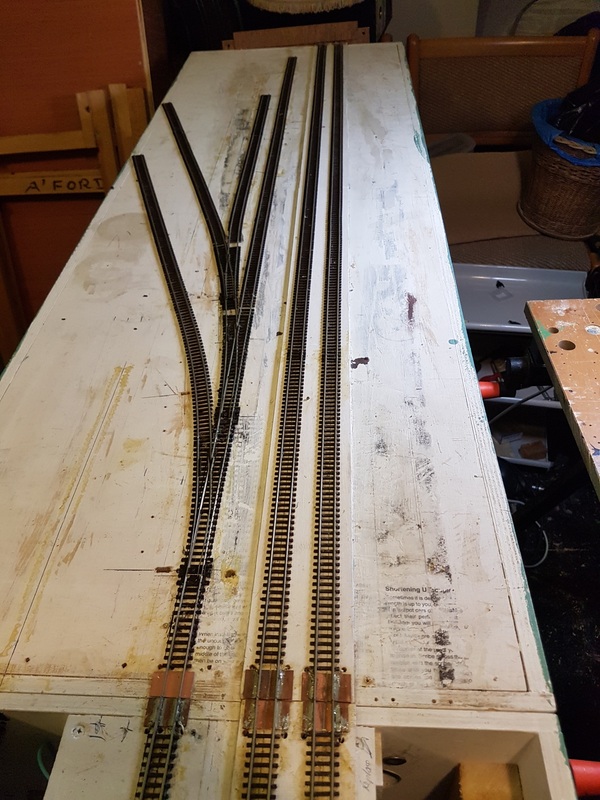 The track is all down, and I need to now get underneath for a little wiring, and to refit four point motors. But before I can do that, we have to finish off the Stuttgart layout. 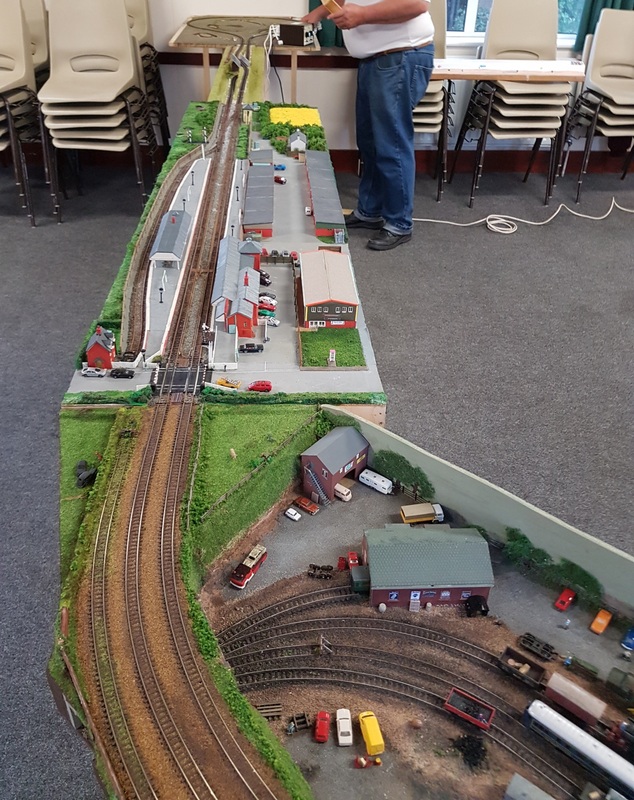 Allan, Derek and I set up our Stuttgart N-club branch on Sunday, and got a train running around. However, it did derail from time to time, and there were a few electrical issues! So I have some more fettling to do. Addersford needs a new piece of rail slipped in to get rid of a large gap in the track joints, and also 5mm or so sawn off all the legs. I had though they were too high when we last exhibited the modules, and a little careful measurement showed this to be the case. My two modules need a check on the track spacing at the baseboard ends, or perhaps just a little careful filing to give a smooth transition between boards. And lastly, I need to make up some wiring loops to get us between boards. We think that Martin, Derek and I have all used different conventions for the wiring – none of which are the same as the N-club recommended standard. Typical men – should have read the manual….. I have a number of other interesting ideas and projects ‘bubbling under’, but these will be for another time. Next post had better be some pictures from the Uckfield show…. This entry was posted in Jon's layout ramblings, Layout design, N Club International, On my workbench and tagged ESNG, Layout design, modular layouts, On my workbench. Bookmark the permalink.